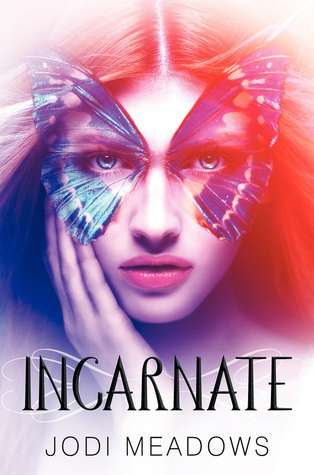 I loved Incarnate by Jodi Meadows! I wasn't sure what to expect going into this book -- all I knew was that reincarnation was involved, and in a way I'd never seen it before. It seemed like something I would like, and I was right. Jodi Meadows created a beautiful fantasy world, where for thousands of years, a million people have been reincarnated over and over again. I had lots of questions about why this happened, some that were answered in Incarnate, and some that were not. I'm excited to learn more about the mythology of the world as the series progresses. I loved the romance between the two main characters, Ana and Sam. From the summary it was clear that Ana was a new soul, meaning she was a teenager, and Sam has been reincarnated for thousands of years, meaning he's a lot older than her, so at first I was worried that their relationship might come across as wrong because of their age gap. Luckily this wasn't the case. The author made it clear that even though the souls are reincarnated, body chemistry and age also contribute to how a person acts and behaves. Also, Ana and Sam were so perfect together that their age gap was easy to overcome. Their relationship grew throughout the book, which I liked. Ana is a likable, relatable character who I found myself rooting for throughout the whole book. She's unsure of herself, but strong and determined at the same time. I'm excited to read more about her and the world Jodi Meadows created in the next book in the series. Also, there was a masquerade scene in this book, and it was done beautifully! So enchanting and magical. It was my favorite scene in the story. Incarnate is definitely a book I recommend picking up when it comes out in 2012. I read the first chapter of the e-ARC from Netgalley, and I can safely say that if this book is as good as others are saying - and with what I have read so far - I'm just going to love this book. Thanks for the review!